Wallace View apartment is an upper floor apartment that has been beautifully and carefully renovated to a high standard featuring period details restored to their former glory. This apartment is tastefully decorated with a fresh modern atmosphere. Centrally located and fully equipped it is the perfect accommodation for your stay in Stirling and surrounding areas. With a stunning view of Wallace's monument to wake up to we're so confident you will love the place so much you will want to stay longer! 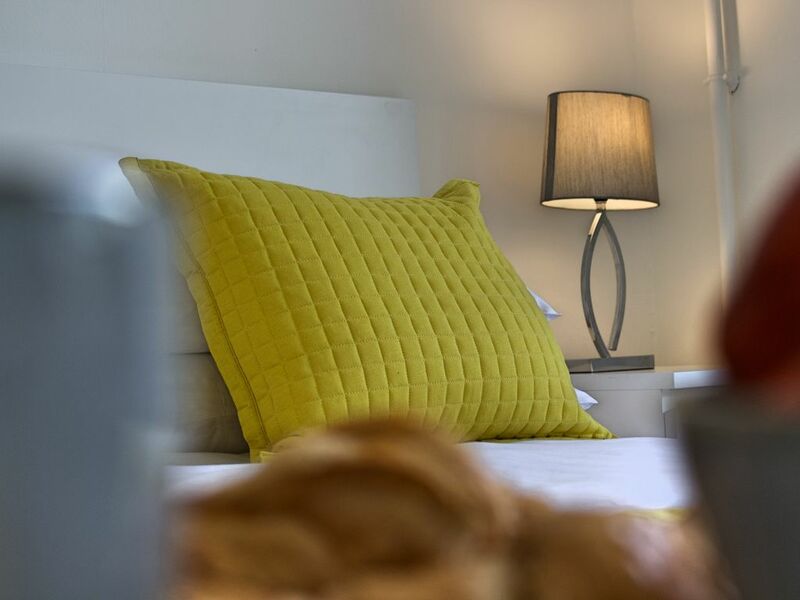 The apartment has two beautiful bedrooms, one of which has a super king size bed which can be separated into two single beds to allow for flexible sleeping arrangements for our guests. Please let us know what configuration you would prefer at the time of booking. The second bedroom has a comfortable double bed. Both bedrooms have wardrobes and side tables with lamps. The shutters on the windows have all been refurbished and can be closed at night to provide privacy and keep out the early morning light. The open plan lounge and kitchen have been tastefully decorated. The views from the carefully renovated sash and case window in the this room will allow you views of Wallace's monument. The modern fitted kitchen has all the mod cons including a coffee pod machine, dishwasher and even a washer/dryer. It is fully equipped with all pots and pans and crockery etc to allow you to cook a three course meal if you wished! The shower room is a spacious bathroom and fitted with a generous sized shower enclosure. We provide you with hair and body wash and hand wash by the sink. There is a car park no more than 150 metres from the apartment and it is only £2.40 for the whole day or £12 for a week. Parking directly outside the apartment is also possible but it is charged on an hourly rate starting from £1.50 during business hours of 8.30 am till 17.30 pm Monday to Saturday. There is a car park no more than 150 metres from the apartment and it is only £2.40 for the whole day or £12 for a week. Parking directly outside the apartment is also possible. Tea bags, instant coffee, sugar, milk and complimentary biscuits are all provided. There is a flight of stairs to this upper floor apartment and no lift in the building. We are more than happy to provide any extras such as food shopping, breakfast packs, champagne for special occasions and hampers prior to your arrival. Please do not hesitate to ask and we will endeavour to do our best to fulfil your request. Beautiful , modern, great location. This is a terrific apartment nicely on the edge of Stirling. Easy walk to the Castle, 5mins drive to Wallace monument. Bars and restaurants easily in walking distance. The apartment is on the first floor, is beautifully furnished, spacious and welcoming. All aspects of the accommodation were excellent, a great break. Modern, clean and very comfortable. I had a wonderful stay.